When exercising in a hot environment (an environmental temperature of 86 degrees Farenheit or more), even a little loss of fluid will impair performance and increases the possibility of suffering a heat injury. Everybody responds differently to heat stress, and the effects should not be underestimated. Thirst is the body’s natural dehydration indicator. If you are thirsty, then it is too late, you are already dehydrated – avoid feeling excessively thirsty. Drink adequate amounts of water daily. The general guideline is one liter for every 1000 calories you consume. 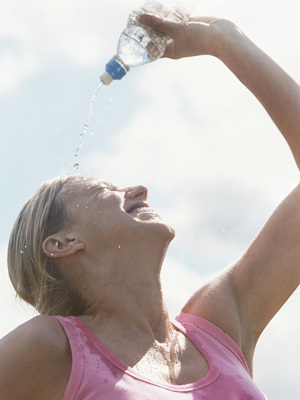 Therefore, if you are sweating profusely, you need to drink more to replace fluid loss. For every pound that is lost, drink two cups of water. To determine how much weight you’ve lost, take weight measurements before and after profusely sweating or following the end of your day. Cramping is usually caused by a lack of sodium, not potassium. Pretzels, potato chips as well as added salt into a sports drink can quickly replenish lost sodium for those cramping and/or losing large amounts of sweat. One important consideration with regard to hydration is urine output. Dark urine can be a sign of significant dehydration. Drinking fluids containing sodium may decrease urine output, particularly when dehydration becomes significant (less than two percent of body mass). A low amount of sodium can be found in sports drinks because it improves taste and stimulates thirst. Drinks like this with added electrolytes (like Cytomax and Hammer Gel) may be the best choice for significant dehydration. During long, hot exercise, sports drinks with standard sodium concentration may be ideal because studies have shown less fluid is consumed as taste decreases. The ideal sports drink depends on your sensitivity to the type of sugar source, your fitness level, the duration of exercise and the temperature and humidity of the environment. Drinking fluids with a carbohydrate concentration of less than 8 grams (like soft drinks, energy drinks and fruit juice) during exercise delays gastric emptying and slows fluid delivery. Therefore, sports drinks are the best choices during long, hot exercise, especially where fluid demands are high, such as running, cycling, basketball, etc. Be aware hydration is also necessary for proper digestion of food and cellular metabolic processes. Proper hydration impacts health on an assortment of levels.